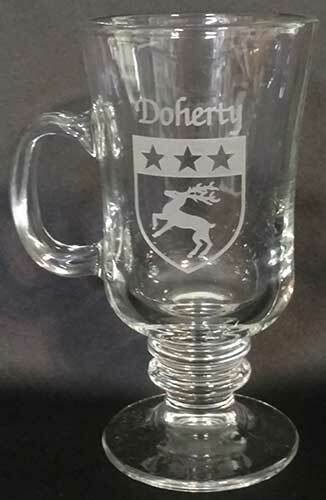 These Irish coat of arms coffee glasses are limited to the name Doherty. Only one set of four glasses is available. These Irish coat of arms coffee glasses are permanently sand etched with the surname along with the coat of arms image. The Irish coffee glasses come in a boxed set of four, 8 1/2 ounce glasses, that are dishwasher safe and made in the United States. The coat of arms Irish coffee glasses are a traditional footed design with handle; they stand 5 3/4" tall.